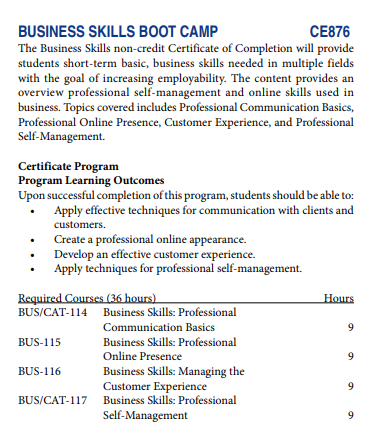 Earn the new noncredit Business Skills Boot Camp Certificate in as little as in 8 weeks. New Students: Call Bonnie Langley at (951)222-8624 for assistance with enrolling. Continuing students (those who have already been taking classes at RCC) please add one or more of these classes to your schedule. If a class is closed please add yourself to the waitlist and attend the first class meeting. Contact janet.lehr@rcc.edu or visit Business Education Building 220E if you have trouble adding a course or a class is closed.